Marie Colvin Journalist Last Video - Homs, Syria under Siege | Is This The Beginning Of The End Of The World? Marie Colvin was an American journalist who was killed Wednesday in the besieged Syrian city of Homs, opposition activists and a French official said. Colvin was from Oyster Bay, New York, and was in her 50's. She was a veteran foreign correspondent for the U.K.'s Sunday Times newspaper. This video is Colvins last broadcast about the situation in Homs, Syria. It was aired on Tuesday in U.K. She also talks about it's Baba Amr suburb and how snipers is all around. 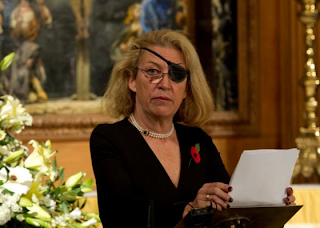 Colvin is wearring an eye patch because back in 2001 she had lost sight in her left eye doing a report from Sri Lanka. She was hit by shrapnel.